These modern and sophisticated cleats can be retracted almost completely into the deck. The material is stainless steel type AISI 316 and all visible parts are high-gloss polished. 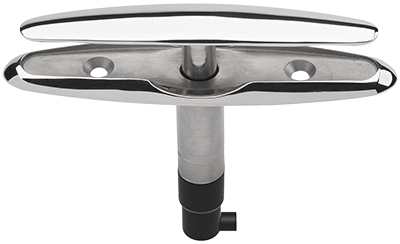 The clever design ensures that the cleat will not rattle either in the raised or the retracted position. A simple locking device secures the cleat when retracted. Three versions are available. Only 3 holes need to be drilled in the deck and the fitting is pre-drilled to accept ø 8 mm countersunk machine screws. A backing plate is supplied as standard. A water drain, to which a ø 6 mm hose pillar can be connected is also standard.